The narrow, winding canyon chiseled by Aravaipa Creek, lined with lush, riparian habitat, offers some of the most spectacular and remote scenery found in Arizona. Roughly 120 miles southeast of Phoenix, Aravaipa Creek meanders through private and federal land within Graham and Pinal counties. A total of 69,600 acres surrounds this perennial stream, including the 19,700-acre Aravaipa Canyon Wilderness Area, administered by the U.S. Bureau of Land Management (BLM) and the 9,000-acre Aravaipa Canyon Preserve, managed by The Nature Conservancy (TNC). Aravaipa Creek lies within the Basin and Range region of southern Arizona, emerging from the Pinaleno, Santa Teresa, and Galiuro mountains at an elevation of about 3,000 feet. It then flows westward and enters a narrow canyon with pronounced gradient. Rock walls within the 10-mile canyon rise more than 1,000 feet. Canyon widths rarely exceed 300 feet, and sometimes constrict to less than 60 feet. The lower 5 miles of stream is ephemeral, disappearing into the stream bed before reaching the confluence with the San Pedro River. Aravaipa Creek’s 17-mile-long perennial reach supports the best remaining assemblage of native desert fishes in Arizona, including the federally listed spikedace and loach minnow. Researchers have recorded 228 species of birds in Aravaipa Canyon, including the endangered peregrine falcon, the zone-tailed hawk, and the yellow-billed cuckoo. A healthy population of desert bighorn sheep roam the area, along with 44 other mammals such as black bears, bobcats, coyotes, and mountain lions. Aravaipa Creek also provides important habitat for at least nine species of bats. Flows in the upper reaches of Aravaipa Creek are intermittent. Within the preserve lands the flow becomes perennial, fed by springs, seeps, and tributary streams. A limited amount of groundwater is pumped along the creek from privately owned reaches for farming and grazing, at times drying short segments. The Nature Conservancy and the BLM have instream-flow rights that are used to maintain base flows for conservation purposes. During prehistoric times the Hohokam, Mogollon, and Salado Indians lived in Aravaipa Canyon, hunting game and growing a variety of crops along the riparian zone. By the sixteenth century, the Sobaipuri Indians were irrigating farms near the confluence with the San Pedro River. During the nineteenth century, the Aravaipa band of Apaches lived in the area and fought many battles with the U.S. Calvary during that turbulent time in Arizona history. By the late 1800s and early 1900s, Hispanic and Anglo settlers began grazing stock and developing copper mines in the watershed. Currently, limited ranching continues and the once thriving town of Aravaipa, established in the 1800s, is now an Arizona ghost town. The 19,700-acre Aravaipa Canyon Wilderness was designated by the United States Congress in 1984. The Wilderness Act of 1964 described wilderness as “an area where the earth and its community of life are untrammeled by man, where man himself is a visitor who does not remain.” Access to the Aravaipa Canyon Wilderness is limited to 50 people per day in an effort to preserve its wild character. Permits are available only through the BLM’s Safford District Office, (520) 428-4400. 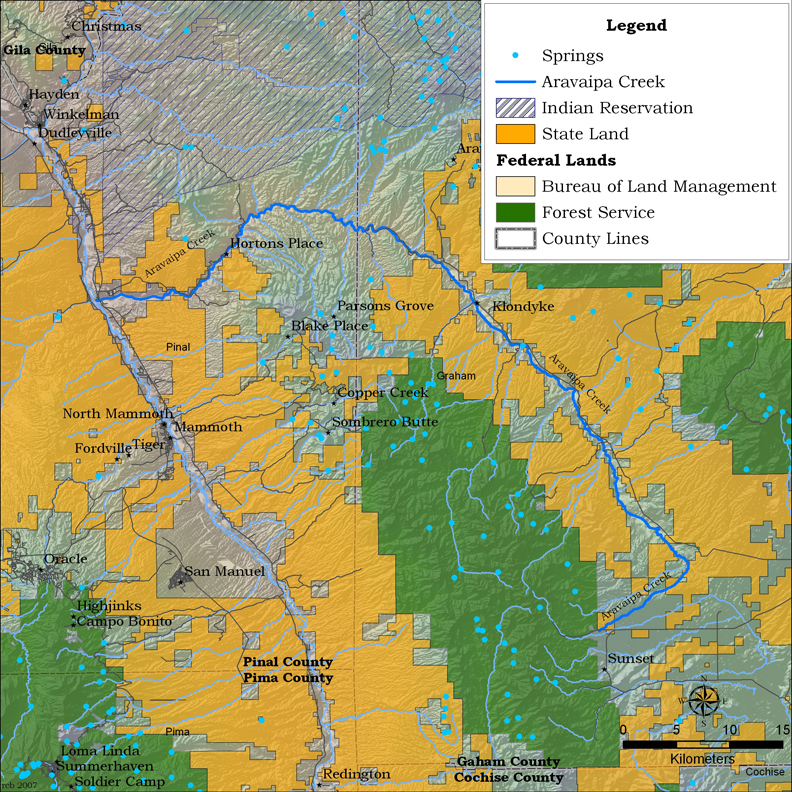 The Nature Conservancy’s 9,000-acre Aravaipa Canyon Preserve includes lands at both east and west ends of the canyon as well as preserve lands, intermixed with public land, on the canyon’s south rim. Access to the Aravaipa Canyon Preserve is allowed only with prior authorization from the staff by calling (928) 828-3443. The Nature Conservancy has established an active management program to ensure the long-term protection of the stream system and its mixed broadleaf riparian forest composed of cottonwood, willow, walnut, alder, and sycamore trees. This program includes fish monitoring, controlled burning, and removal of non-native species. Their goals also include restoration of grasslands in the upper watershed. BLM management of the Wilderness Area supports most of these same conservation goals. Jeri Ledbetter and Chuck Minkley. Minckley, W.L. and P. C. Marsh. 2008. Chronicle of a vanishing biota: Inland fishes of the American southwest. Univ. Az. Press, Tucson. (In Press). Minckley, W. L. 1981. Ecological studies of Aravaipa Creek, Central Arizona, relative to past, present, and future uses. 1981. Report to U. S. Bureau of Land Management, Safford, AZ. Minckley, W. L. 1973. Fishes of Arizona. Sims Printing Co., Phx. 1981. Ecological studies of Aravaipa Creek, Central Arizona, relative to past, present, and future uses. Report to U. S. Bureau of Land Management, Safford, AZ. Stefferud, S. E. and P. N. Reinthal. 2004. Fishes of Aravaipa Creek Graham and Pinal Counties, Arizona Literature Review and History of research and monitoring. Report to U.S. Bureau of Land Management, Safford, AZ. Cooperative Agreement AAA000011 Task Order AAF030025. Velasco, A. L. 1997. Fish population response to variance in stream discharge, Aravaipa Creek, Arizona. Ms Thesis., Arizona State University 1997. The Nature Conservancy Website 2007. http://www.nature.org/.